In response to the lash of Tropical Depression Usman in the Bicol Region last December 30, 2018, the Department of Health Center for Health Development (DOH CHD) Bicol, coordinated with the Provincial DOH (PDO), Provincial Health Offices (PHOs), and other partner agencies to streamline its health services to address the basic needs and uplift the health status of the evacuees affected by Usman. Surveys as of January 8, 2019 through the DOH Public Health Preparedness and Response Unit (PHPRU) reported a total of 1,561 families or 5,776 individuals have been evacuated. The DOH Quad Cluster composed of the Water, Sanitation, and Hygiene (WASH), Mental Health and Psychological Support (MHPSS), Nutrition, and Medical team have been deployed to monitor and conduct health services to the evacuees round-the-clock. The DOH WASH team provided technical assistance on the installation of filtration systems and conducted rapid water quality assessment together with the WASH team of PHO Camarines Sur. Water trucks were also disinfected to ensure the availability of safe drinking water for the affected residents. The Nutrition team of DOH set out to determine the nutrition situation for evacuees ages 0-59 months and conducted rapid nutrition assessment, meanwhile the MHPSS team applied psychological first aid to 8 individuals and 3 families in Tiwi, Albay who have been affected by a series of massive landslides. DOH CHD-Bicol also deployed Human Resources for Health (HRH) to provide medical assistance such as administering immunization on measles and pneumonia, as well as treatment and cleaning of wounds of the injured evacuees. DOH CHD-Bicol allocated over 6 million worth of relief goods to be distributed in Albay, Sorsogon and Camarines Sur, which include water containers, hygiene kits, medicines, and body bags. “The DOH will be actively involved in the efforts to address the need for medical services, safe drinking water, and sanitary toilet facilities. We have to ensure that everyone maintains the state of health. No one must be ill; and if there is inevitable illness, there are deployed teams to provide check-ups for the pregnant, elderly, and children,” said OIC Regional Director, Dr. Ernie Vera. DOH CHD-Bicol assures continuous coordination with partner agencies, and provide technical assistance to PDOs and PHOs. The Health Policy Development and Planning Bureau, Department of Health and the Philippine Council for Health Research and Development, Department of Science and Technology is scheduled to conduct a one day joint meeting to formally launch the new health policy and systems research priorities for 2019 under the Advancing Health through Evidence-Assisted Decisions with Health Policy and Systems Research (AHEAD-HPSR) Program of the Department of Health on January 30, 2019 at Hotel Jen, Roxas Blvd. Manila. To present the Single Joint Research Ethics Review Process in the DOH. The Department of Science and Technology- Philippine Council for Health Research and Development (DOST-PCHRD) is pleased to announce the call for nominations for the DOST-PCHRD- Undergraduate Thesis Grant in Natural Products. A thesis grant amounting to Fifty Thousand Pesos (PhP 50,000.00) will be given to two (2) thesis proposals per region. In addition, an incentive of PhP 10,000.00 will be given to the advisers of the qualified thesis studies which will be given upon completion of the project and submission of the required deliverables. Deadline for submission of nominations to the consortium is on May 31, 2019, and deadline for submission of endorsed proposals to PCHRD is on June 10, 2019. 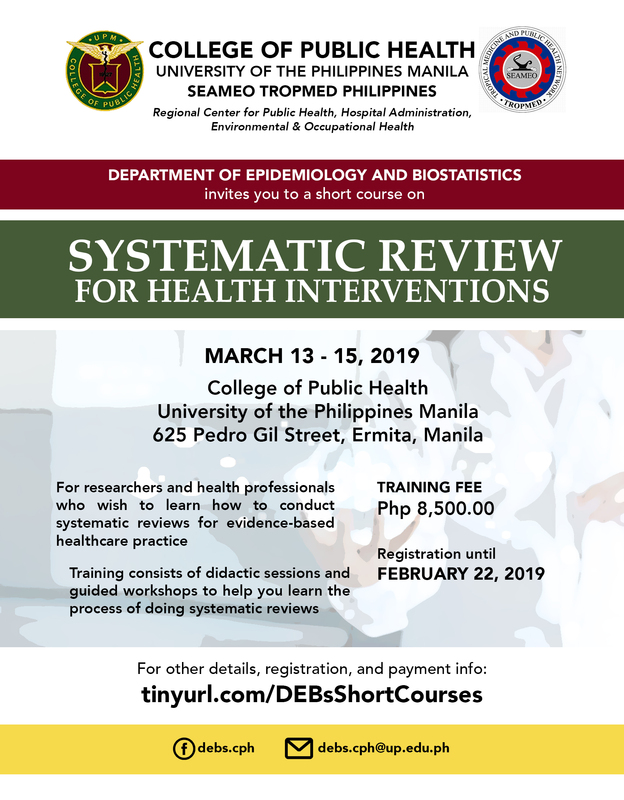 LEGAZPI CITY - The Department of Science and Technology-Philippine Council for Health Research and Development (DOST-PCHRD) through the Symmetrix Research Consultancy conducted a 3-day training for the Regional Health Research and Development Consortia (RHRDCs) entitled Training of Trainers in the Basic Research Method held last December 3-6, 2018 at the second floor, Carlota-Paz Function Room, Hotel Jen, Pasay City. Symmetrix Research Consultancy Co. was contracted by PCHRD to lead in developing a standardized training module for the Basic Research Methods Course. 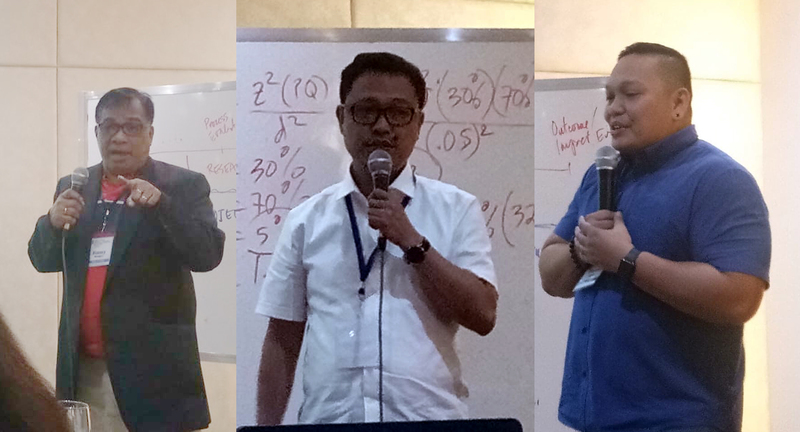 This activity aims to produce the first batch of trainers capacitated to deliver the BRM training using the standardized manual that will be produced.